Mae Tao Clinic located in the Thai border town of Mae Sot in Tak Province officially moved to a new purposed built hospital in an effort to keep providing care to people from Burma unable to access the country’s failed healthcare system. 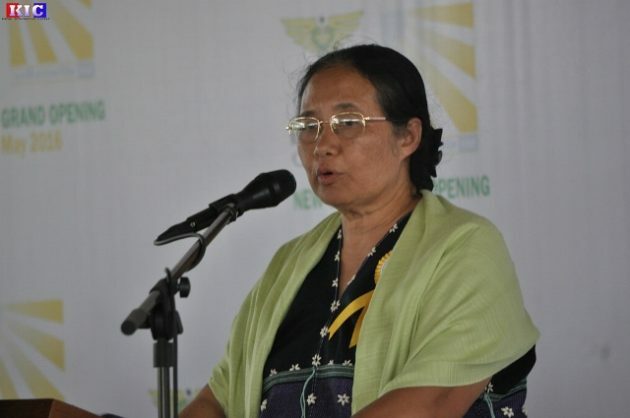 Dr. Cynthia Maung, the founder and director of Mae Tao clinic told reporters at the new clinic’s opening ceremony on May 28 that they will continue to offer healthcare services to displaced people and Burmese migrant communities on both sides of the border until the political and health care reformation improves in Burma. Dr. Cynthia Muang said that despite the changes currently taking place inside the country many services will take years to improve. Dr Cynthia said that the clinic is also coordinating with other healthcare providers to help these community access the available healthcare system in both countries. Dr. Cynthia said that in the future, when the healthcare provision of Thailand and Burma can cover Burmese migrants and the displaced communities on both sides of the border, the clinic can then work more on prevention and promotion, leaving the treatment with the mainstream healthcare systems. The opening ceremony was attended by Thai government officials, U Kyaw Thu from Burma’s Free Funeral Services Society, Ko Min Ko Naing and members of of the 88 Generation Students, political parties, civil society organizations, INGOs representatives and students from migrant schools in Mae Sot – a total of as many as 3,000 people. U Kyaw Thu, the chairman of FFSS said that there are still many things need to be done in the country which had been under tight control by military government and urged the international communities and the Burma government to support Dr. Cynthia efforts. The newly open MTC building is equipped with 150 beds and is situated near the Mae Sot highway, about four kilometers north of the old clinic compound. Dr. Cynthia said that it is an honor to have a new clinic after the 28 years since the original clinic was opened. She said that this has been possible because of the cooperation and support from the local Thai community, donors, friends and colleagues. The new clinic ground cost 50 million Thai Baht (around USD$ 1.5 million) and this is the result of 10-year preparation period. After 1988 student uprising in Burma, Dr.Cynthia Maung and colleagues who fled to the Thai-Burma border opened the Mae Tao Clinic in 1989 working out of a house. Now, Mae Tao Clinic treats as many as 140,000 patients every year, including migrant workers, displaced people, refugees and people from inside Burma.